But, I awoke one morning to the realization that no one else could write it because I was the only one there and would have to tell it myself. I’ll never forget the elation of attending that first Creative Writing class and how I was sure I could tell this story in a screenplay or one book. Four books later, the story is now preserved. The screenplay is yet to come. I never dreamed of being a writer. It was never my goal in life. That goal was my sister’s. I simply had a story that not only begged but, demanded to be told. My initial approach was to tackle the story in first person. I quickly discovered that wasn’t possible for me. It was too personal, and I couldn’t separate enough from it to objectively relate it. So, when a girlfriend suggested I create characters to tell the story through, a light came on. That was the perfect answer. In creating my character, I’d heard the story many times in my life about how my mom had intended to name me Darlene when I was born. But, my older brother insisted that I be named Janice. Knowing that story, I resurrected Mom’s intended name and put a twist on it using Darlina. The last name Flowers simply flowed. Luke Stone’s character name came from my favorite uncle growing up, Uncle Luke. So, using his name for Rick came easily. The last names also fit our personalities. I was the soft naïve one while Rick was seasoned in life and hardened by his lifestyle. And, so the journey began with that first word. If you open “Flowers and Stone,” you’ll find the first word of the first sentence is Darlina. While becoming a writer was not my goal in life, it fits like a comfortable glove. Four biographical fiction books, five published short stories, a paranormal romance novel along with numerous songs and poems under my belt, I can’t imagine doing anything else. 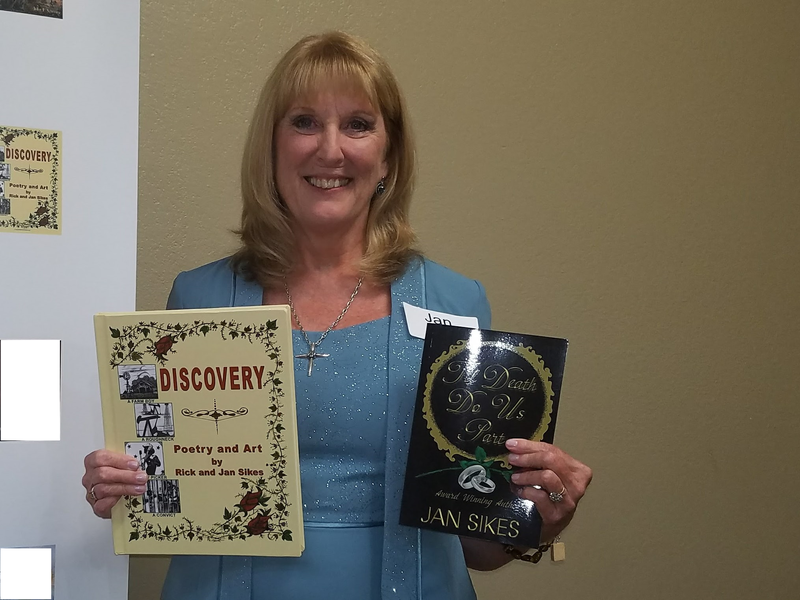 I hope you enjoy this RRBC SPOTLIGHT AUTHOR tour and will join me on each stop! 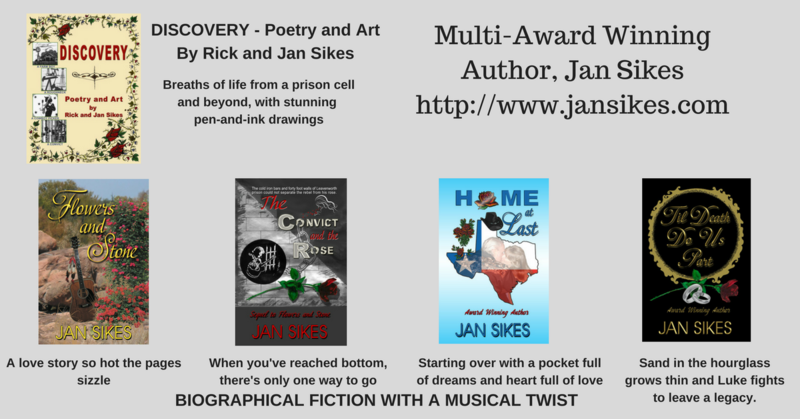 This entry was posted in Spotlight Authors and tagged #RRBCSpotlightAuthor, @rijanjks, JAN SIKES, WHY I WRITE. Bookmark the permalink. Glad you stopped by Micki. I’m just finishing up reading Flowers and Stone. I didn’t know I had it; and The Convict and the Rose as well, just waiting to get read. These tours are helping me remember books that we need to be read. Lol! Jan, I’m glad that your girlfriend suggested that you write your story and that a passion for writing was sparked! All the best with your tour, enjoy your time in the spotlight! Thank you, Shirley, for hosting! Thank you Mark for supporting Jan’s tour. I always say “better late than never.” I am very proud of you, Jan and I send my congratulations. Shirley, thank you for hosting Jan.
Karen, its never too late. Just keep on sharing and it will keep Jan’s tour alive. Thank you so much for stopping by. Congratulations, Jan! I’m sure you’ll love this wonderful spot this month. It’s such an honour! Thanks for hosting Jan, Shirley. My pleasure Maretha, and thank you for visiting and supporting Jan.
Joy I’m glad you made it by. Fantastic blog piece, Jan. Writing such a personal story must have rewards and heartaches. Congratulations on the Spotlight! You truly are worthy. Thanks for being such an amazing host, Shirley! Thank you Beem. That’s sweet of you to say. Shirley, thanks for hosting Jan. I always enjoy stopping by your blog. Hi Rhani! I’m always happy to see you. Thanks for stopping by and I am glad you like my blog’s updated look. What a great way to add perspective to Jan’s writing, learning more about how the very process of learning and telling their story has transformed her life. Thanks for sharing this, Jan, and to you, Shirley for hosting! Good luck on the tour. Stephen, I’m so glad you came by. Congratulations, Jan! I’m looking forward to getting to know more about you and your work. Have a wonderful time in the spotlight. Nice to see you, Shirley! Hi Laura. Its really nice to see you too. Thank you so much for dropping by for Jan.
Its a pleasure having you here Natalie. So lovely to see you and your books being spotlighted this month. Jan – congrats! You write from the heart and this creates a strong emotional bond with the reader. Thanks Wendy for stopping by. Jan, I can imagine how hard it must have been to write such a personal story. Love the quote! Shirley, thanks for hosting today. My pleasure Michelle. I’m glad you came by. Congratulations, Jan!! You are so deserving of this honor and I’m thrilled to see you in the Spotlight! 🙂 Shirley, thanks so much for hosting!! Mar, thank you for stopping by. Jan and I appreciate you and all that you do. Jan, you say your sister was the writer. Did you ever think about letting her write your story before you decided to do it? Thanks Dawn for sharing this blog. Let’s hope it goes viral!! Congratulations, Jan. Enjoy the spotlight, so deserved. Big hugs. Vashti, thank you for stopping by and it was my pleasure to start the train moving for Jan. Have a great day! I am so inspired by your story Jan. Deciding to write about it and doing it so well. We are all lucky you wrote that first word and started your writing journey. Enjoy your spotlight tour! Denise, thanks so much for your support. Hello and welcome Jan. Sorry about the glitch which prevented me from pubishing on time. Have a great tour!